I'm thrilled to be kicking off the blog tour for Meenoo Rami's recently published book, Thrive. I had the pleasure of meeting and talking with Meenoo at NCTE in Las Vegas in 2012. After the conversation we had over dinner, it was clear to me that Meenoo is a lifelong learner. She's curious and thoughtful in her questions; supportive and insightful in her responses. I'm the kind of person who is hopeful and optimistic and Meenoo is the kind of person who believes in ideas with me. I know that when I share an idea with Meenoo, she's going to say something along the lines of, "Do it!" More than anything, I believe in living a growth mindset. I believe in being open to learning and trying new things, to successes and failures and trying again. In my current position, my role is very much modeling the growth mindset and encouraging the teachers I work with to embrace it as well. When I interact with others who believe in the growth mindset, like Meenoo, it completely nourishes me and helps me believe that I am doing good work. In Thrive, Meenoo starts off by encouraging teachers to look for mentors around them - whether a school assigns you one or you find your own . Having mentors in our lives who can support us throughout our careers is vital. I'm constantly inspired by colleagues near and far. There are so many people in my life who shaped who I am today. Steven Layne calls these people "balcony people". I'm so grateful for all the balcony people in my life. I love that Meenoo points out that even experienced teachers need balcony people. Reading Thrive, I anticipate that you'll feel like Meenoo is a balcony person for you through her words and encouragement. Each chapter shares ideas to empower teachers to know how to maintain their autonomy and to teach in alignment with their core values. She writes, "...I believe the essential work is to determine how we can align our teaching with our values" (p. 68). Holding true to your values and beliefs is imperative in teaching. I believe teachers enter the profession to make a difference in kids' lives but there are so many influences that pull us in different directions and it's not always easy to remember that ultimately, we have to make choices that are best for kids. Meenoo reminds us that teaching is complex. She tells us, "[w]e need to honor the complexity that lives in the art of teaching" (p. 44). Teaching is not easy. Teachers are constantly making decisions - whether it's in planning out lessons or changing direction in the middle of a lesson based on student feedback. Meenoo asks us to recognize the complexity in teaching and then to find a balance in our lives in order to stay motivated. Meenoo offers ideas for how to find intellectual joy in our work as educators to maintain our motivation. She reminds us to take care of ourselves so we can be our best for students. She explains, "[i]t is the very things that we think we don't have time for that may just sustain us through the rough patches of the year" (p. 54). She continues, "[t]hink about the last time you turned down an invite to coffee with a friend, seeing a concert, or going to the movies. These very things may provide you with the inspiration to find ideas and a necessary mental break from the rigors of the classroom. After all you're providing the inspiration for so many of your students; you need to find a way to get inspired by the intellectual pleasures, art, ideas, and movements of our time" (p. 54-55). I wholeheartedly agree with this and it speaks to me now that I work more directly with coaches and teachers than students. If administrators could recognize this and help teachers realize that they need to take care of themselves and nourish their own interests, it would make a huge difference in the motivation and inspiration they could bring to interactions with students. Thrive offers so many ideas for what new and experienced teachers alike might do to stay engaged and motivated in such a dynamic profession. For me, connecting with other passionate educators here on my blog and on Twitter but also in real life, keeps me energized. I've found that reading, writing, running and practicing yoga also help me focus my thoughts and feel empowered. I would love to hear what you do take care of yourself and/or nourish who you are so that you can be the best educator. Please share in the comments! 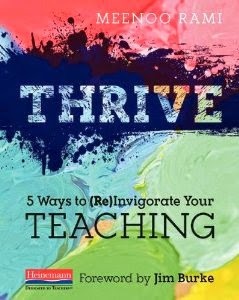 Here's a summary of Thrive from Goodreads: "As a novice teacher, Meenoo Rami experienced the same anxieties shared by many: the sense of isolation, lack of self-confidence, and fear that her work was having no positive impact on her students. In "Thrive, " Meenoo shares the five strategies that helped her become a confident, connected teacher. From how to find mentors and build networks, both online and off, to advocating for yourself and empowering your students, "Thrive" shows new and veteran teachers alike how to overcome the challenges and meet the demands of our profession." Be sure to visit all these great blogs who are celebrating Thrive. and read guest posts and interviews from Meenoo herself! HERE at Teach Mentor Texts! Kira Baker Doyle at Kira J Baker-Doyle, Ph.D.